Here in Malasaña's most well-known square is where you'll find locals looking for a party meeting up regularly (although gone are the days of the free-flowing public drinking, thanks to a greater police presence). 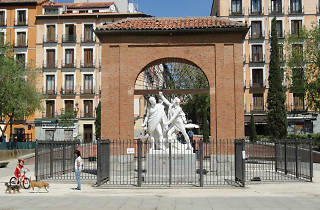 All the merriment is presided over by a great fenced-in arch that represents the entrance to the Cuartel de Monteleón: the square is located on the site where the Palacio de Monteleón was built, and later made into the Parque de Artillería in 1807 and whose troops died in the battle against French occupation on May 2, 1808. 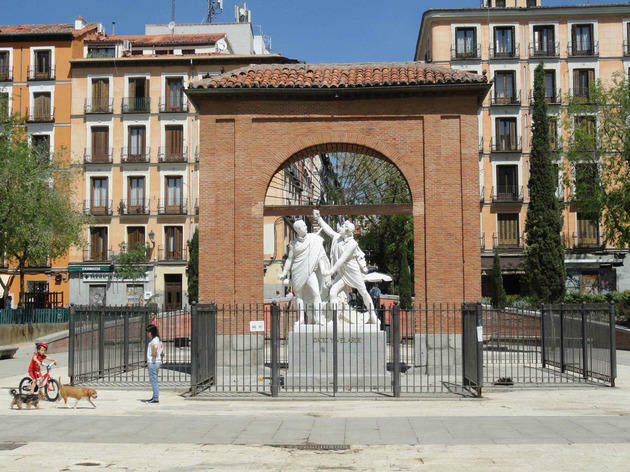 In front of the arch is a marble statue of captains Luis Daoíz y Torres and Pedro Velarde, barracks artillery officers who led the resistance against the Napoleonic army. Today the square is full of life, and in summer you'll come across stalls set up for the Dosde Market.